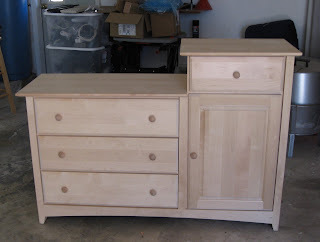 We bought a birch dresser/changing table combo from Furniture in the Raw. After obsessing over a crib, we found this piece of furniture pretty quickly. Above is the "before" shot. John will be staining it, and then it will be ready for Alex's room. Next we will be looking for a glider. Since it has been hard to find what we want in stock at Babies R Us and Baby Depot, I am hoping to find more luck online. What did parents do before the internet?